Airpower® XR200, Airpower® XR1, Airpower XR1 Womens, Airpower® XR2, Airpower XR2 Womens, Black Eagle® Safety 52 Mid, Black Eagle® Safety 52 Low. For the committed emergency responder, the Airpower® XR2 is an excellent choice. These boots provide superior comfort when you need to stand for lengthy periods of time or while you’re on the go. The boot has a supportive arch built in to the footbed that aligns your ankle and foot to its neutral position, facilitating natural foot function. They are waterproof and protect you from blood-borne pathogens. Using the adjustable laced in zipper, you can tailor the fit of these composite toe work boots just right. You will have no problem staying active all day long when you wear the Black Eagle® Safety 52 Low. This composite toe boot has the distinct feature of being ultra-lightweight; and, despite this, the boot provides exceptional performance. Featuring a puncture-resistant midsole, the boot provides protection for your feet from sharp objects such as stones and rocks. The boot is ASTM certified for Class 75 toe protection. It contains an inner liner manufactured by CROSSTECH® making it breathable, resistant to chemicals, water, and blood-borne pathogens. If you work as an arborist or in the forestry industry and require footwear protection all day long, you’ll want to take a look at the Airpower® XR200. This boot features neon-orange shoelaces –for added visibility– with a brown leather design. It includes slip-resistant rubber soles that give you enhanced traction on slippery services. The lightweight characteristic of these boots makes them well-suited for walking around all day without overly straining your feet. 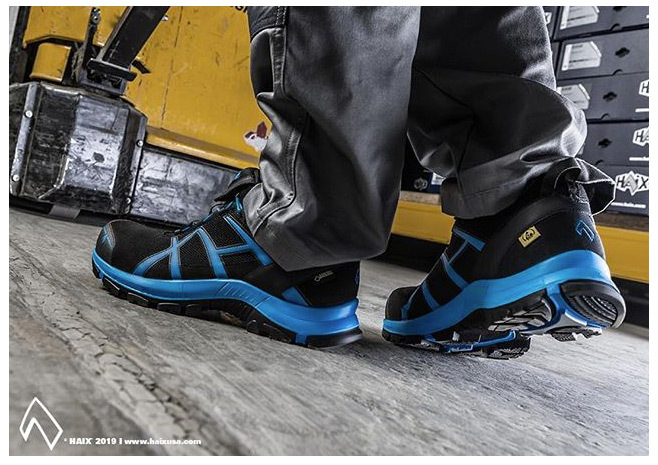 This boot is complemented with the HAIX® Climate System which keeps the boot in temperature balance no matter what work demands you place on it. Shop our selection of composite toe work boots online, or call us today at (866) 344-4249 for more information about the other work boots and shoes we offer.